They're prettier than burning bush/Euonymus alatus and you won't find them invading our natural areas. Cedarglade St. John's-wort and Golden St Johnswort are a few of its common names. Hyper-colored Hypericum frondosum is a vibrant mix of golds, reds, burgundies, oranges and fading greens that pop against the dark bark of neighboring trees. 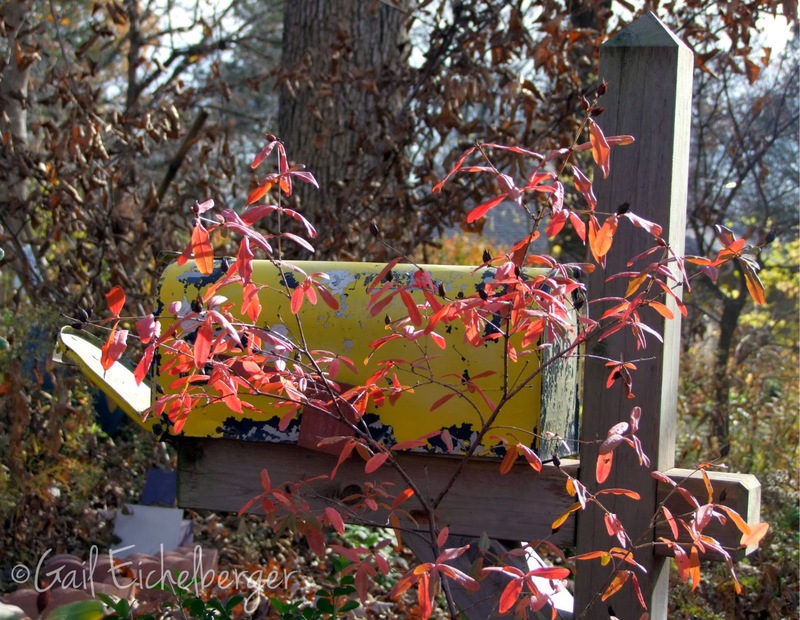 Golden St Johnswort puts on its fantastic hypercolored show beginning in late October or early November and keeps on glowing through most of December. 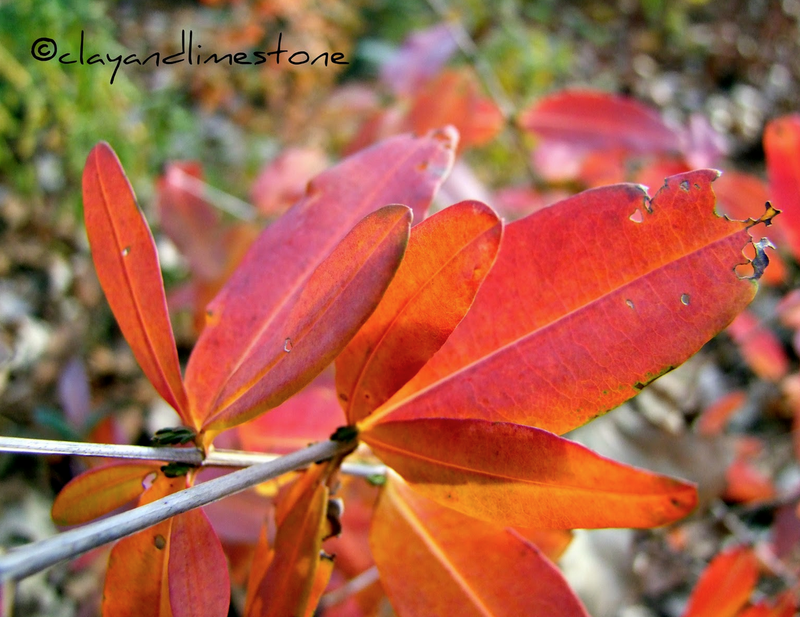 Hyper-colored fall foliage is only one of the reasons to plant Hypericum frondosum in your garden, but, if it's the one that motivates folks to plant a wildlife friendly shrub then I say let's promote its fall beauty every chance we get. Who wouldn't fall for its vibrant oranges, reds, and yellows! I am equally convinced that home owners will appreciate its other fantastic attributes~pollen rich golden flowers, blue-green summer foliage, maturing seedheads/seed capsules and exfoliating winter bark. 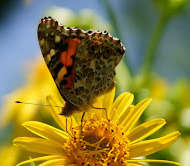 They just need more exposure to native beauties....so, I invite skeptics to tour my garden. They're blown away by the Hyper-colored Hypericums and open to hearing about its wildlife value! I love the oohs and ahhs. Wildlife bloggers and gardeners we can sell/promote this four season beauty as an alternative to invasive burning bush. How many of you have run into gardeners/home owners who assume that all plants sold at garden centers are native? A shocking amount of you have could raise your hands! 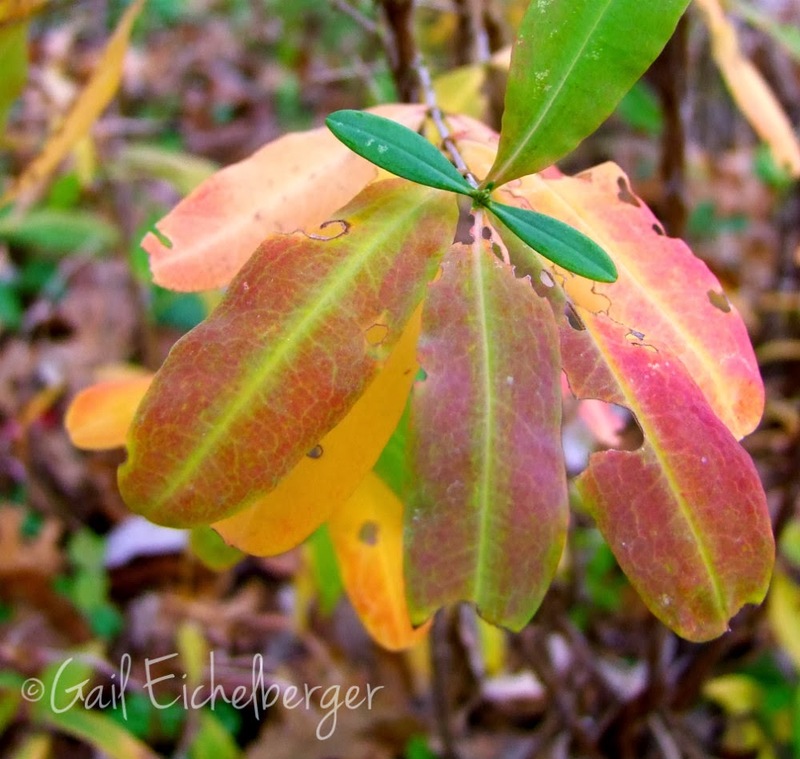 Whenever a friend waxes poetically about the beauty of burning bush I always ask them if they think it's a native plant. They assume it is, like others, because it's sold in reputable garden centers. I use that opportunity to gently educate. Trust me, gentle is better and shaming people never works. 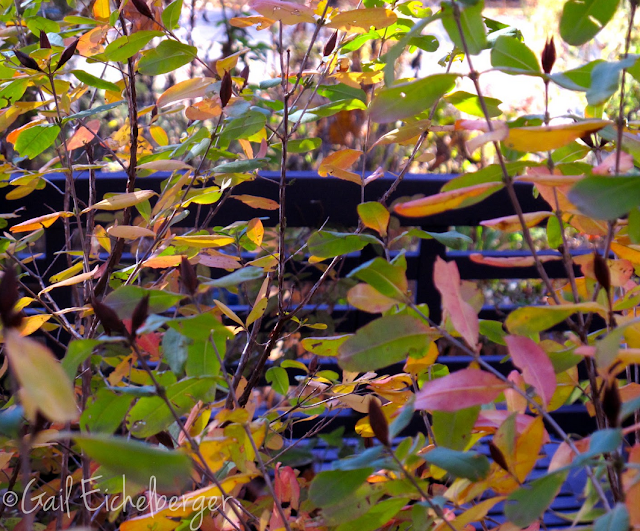 I agree with them that burning bush has very nice fall color, then I wow them with all that Cedarglade/St. Johnswort has to offer. The species is a loose limbed beauty with golden flowers. Bluish green foliage stands out in the summer garden. Exfoliating bark for year round good looks. 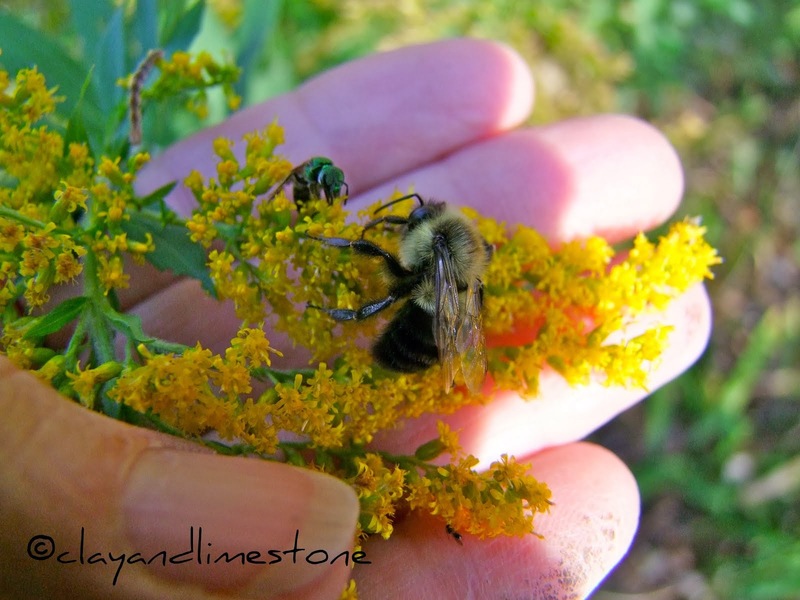 Wildlife/Pollinator friendly: Bumbles, Syrphid flies and Halictid bees~all seeking pollen. It's endemic to forests/woodland that are adjacent to cedar glades. It tolerates the extremes when established~wet winters and dry summers. It blooms the first week in June. Zones 5 to 8; a Southeastern native. Grows quite nicely from seed. Gentle, but, passionate works best! PS. You may notice some older photos in my posts for the next month. I am healing from cataract surgery and hope to back to taking in focus photos soon! Thanks all. 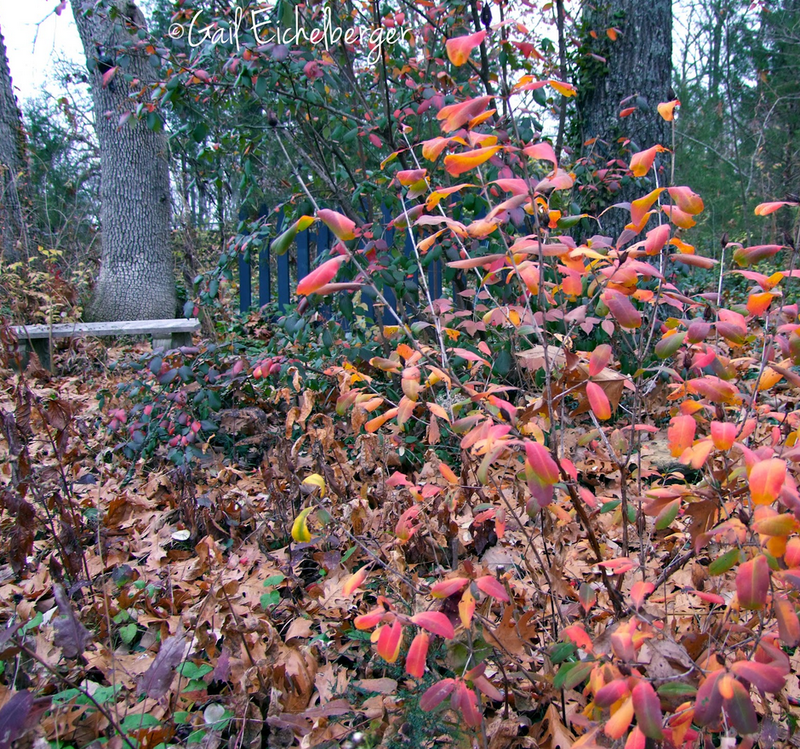 Strangely, burning bush is not invasive in the PNW, I'm not sure why, because it's a staple in plenty of commercial plantings. But it doesn't self-sow itself into natural areas. Plenty of others do (butterfly bush and Scotch broom are everywhere here). Even though it's not invasive here, there are still plenty of other shrubs like Hypericum that I think have more to offer. I love Hypericum's sunburst-type flowers. I've just seen Zone 4 listed, too -- though we're Zone 5 here (by USDA standards). Maybe it might work in Toronto, if I can find it. look after you - I wish you a quick recovery and clear vision soonest! What a beauty...You and the shrublet. Speedy recovery. I've found most gardeners don't appreciate the value of planting native, even horticulturists and landscapers are not pushing it as hard as they could. Having said that I'm see a lot more Hypericum being planted. Oh how I'd love to put these pretties in my garden! But I've tried, and they just don't seem to be hardy enough here. I'll admire yours though! If hypericums like the wet - or if I get set up with a hugelkultur bed you can bet I'll try these in my new 'natural' garden. I hope you heal as well after your surgery as I did. Test your eyes on my Giveaway - Terrariums: Gardens Under Glass published by Cool Springs Press. Lots of great photos and information. Thankfully I don't see too many in my neighborhood...burning bushes that is. But the Hypericums are incredible. Mine still have stunning foliage hanging on with our warm weather. I think I'm in the minority here. I haven't had good experiences with Hypericum frondosum 'Sunburst'. Or rather, I think this plant looks *amazing* when in bloom, covered in yellow flowers that are in turn covered in bees. But that's only for a few weeks in summer and the rest of the year I find H. frondosum seriously underwhelming. That said, mine are all in a difficult spot on a solid clay slope, so perhaps that's why a few have croaked and some of the others seem to be struggling. I also tried another Hypericum - H. densiflorum - which grew really well, but unfortunately the bees seemed completely uninterested in its small flowers (much smaller than H. frondosum's blooms).